We live in a particular time on the continuum of technology. Certainly, the advancements made in all facets of technology have bled into our daily lives in ways we couldn’t have possibly imagined even twenty years ago. It’s no surprise that they’ve sped up the capabilities of audiology by leaps and bounds. The hearing aids we’re wearing today are light years beyond what was available to our grandparents and even parents. In fact, the first hearing aid of the market was actually an ear trumpet. This instrument sounds exactly like what it was: a long, tubular device that eliminated background noise and focused the listener’s hearing on the volume source they wanted to hear. Even taking a much shorter look back, we can see how truly far we’ve come. Within our lifetime, has any instrument gone through as radical a shift as the telephone? Many of us remember a time when a household was lucky to lay claim one telephone for the entire dwelling. These days, it’s common to see children walking around with their own smart phones! With that said, it is of interest to note that the very technologies that birthed the humble landline telephone that also led to the creation of the first modern hearing aids. This is because humans had finally discovered the ways to manipulate and amplify the distortion of sounds. In the late 19th century, the first electric hearing aid was introduced. Named the Akouphone, this device was created by Miller Reese Hutchison in 1898. Very soon after, a little company called Siemens began manufacturing hearing aids. That name might strike you as familiar because they continue to manufacture hearing aids to this day. 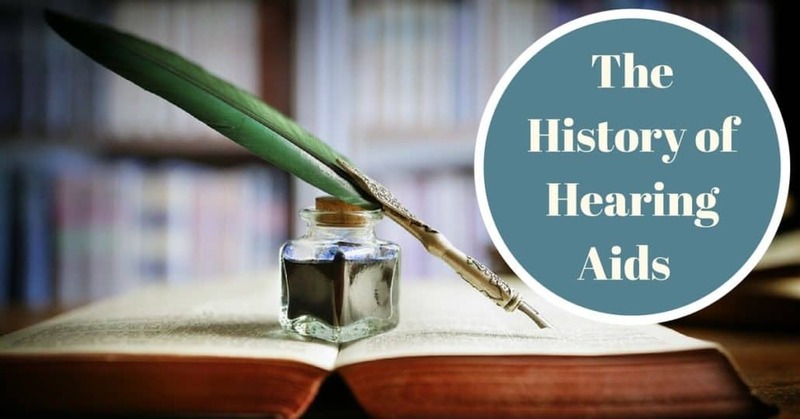 While the first modern hearing aids were exciting in their ability to more successfully amplify sounds, they certainly had their shortcomings. The first models produced by Siemens were incredibly bulky and unobtrusiveness was not a frequent customer review. Described as roughly the size of a small cigar box, folks utilizing these hearing devices would probably marvel at the small size of even today’s largest hearing aids! At this point, the unit consisted of an earpiece, wire and receiver that could be unobtrusively worn under a user’s clothing. However, if this was your hearing solution, you’d also have to simultaneously wear the battery pack that was of such heft that it had to be strapped to the user’s leg. Perhaps because of their size, weight and general importability, it wasn’t until the 1930s that hearing aids began to gain real popularity. This is after the advent of vacuum tube technology which greatly decreased the size of hearing aids and led to their eventual miniaturization and thus, their portability. Already on the path of rapid improvement, fate intervened in the form of World War II. As with many other industries, investment in technologies resulted in breakthroughs and the quality and increasing diminutive nature of the devices. As the middle of the twentieth century approached, vacuum tube technology was entirely replaced upon the advent of transistors in 1948. The discovery was an instant upgrade and adopted throughout the industry, although there were some resulting problems. Manufacturers quickly found out that while transistor technology worked wonders on paper, they behaved differently when worn by humans. Experts had to resolve the complicating issues of dampness and body heat before the technology was deemed truly successful. At this time, hearing aids with circuit boards and smaller batteries made their way into the lives of those with hearing loss. In this evolution of hearing devices, we begin to see units that were truly wearable, with battery, amplifier and microphone all contained within one portable unit. Unfortunately, wires were still absolutely required, making them less that subtle and not a terribly visually appealing solution. As with nearly every modern convenience, the introduction of the computer proved to be a game changer in the hearing aid playing field. Today’s digital hearing solution have their roots in the devices of the early 1980s with the introduction of the digital signal process chip. Only a decade and a half later, the first fully digital hearing aid model was introduced. Today’s hearing aids are so small, intelligent and powerful that even the wearer can forget they’re there. In all, our options are a far cry and a welcome relief from the days of the ear trumpet. Are you ready to try the latest in hearing technology? Contact us at Bay Area Hearing Service to schedule a hearing test and hearing aid fitting. When Should I Update My Hearing Aids? Zebrafish, Mice, and… Hearing Loss?